The renowned flexible defrost heaters manufacturers India, Chhaperia brings the best in defrost heaters. All the defrost heaters of unique designs are available with standard specifications. 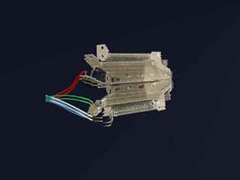 Suiting to industrial and laboratory applications, we design heaters accordingly. The defrost heaters we serve have reached the national and international markets. The extensive range of infrared heaters is embraced at Chhaperia. So, choose one of your choices for your need. We majorly focus on quality and customer satisfaction which drives us to be the leading manufacturer in flexible defrost heaters. They heat the food quickly. Operate for a longer time. The heat transmission losses are negligible since the waves circulate within. We tend to remain in the industry because of the relationship we maintain with our clients. A relationship and value delivery has made us be the refined flexible defrost heaters manufacturers India.